Rebecca J. Gomez: Love This Book! 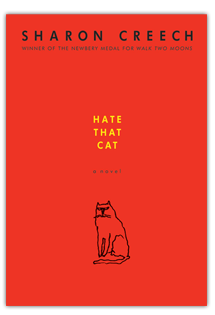 I love HATE THAT CAT just as much as I love the book that came before it, LOVE THAT DOG. In this book, Jack explores poetry once again, sharing about his "hatred" for a mean black cat, and his surprise as a small black kitten creeps into his heart, and his love for his mother. The plot is simple, but the voice draws me in and tugs at my heart strings.